Inspired by a childhood favorite – hot fudge ice cream sundae, but made much healthier, vegan, and refined sugar/oil free! Add all ingredients listed under ‘ice cream’ to a blender and blend until completely smooth. I use a vitamix and therefore do not have to soak my cashews, but if your blender is not very powerful I’d encourage you to soak cashews overnight (or for at leastttt 30 minutes in hot water) for ultimate creaminess. Place this blended mixture into the freezer for 20 minutes… or if you do not have an ice cream maker, pour the mix into ice cube trays (I used these) and freeze overnight or for at least 6-8 hours. Prepare the hot chocolate fudge. To a small bowl add agave, cacao powder, water and vanilla extract (optional) and mix by hand. You can use the fudge as is to keep it raw, or transfer it to a small saucepan and heat over low/medium heat for a few minutes, or until it thickens or begins to bubble. *If you are not using an ice cream maker skip to step #6. If you are using an ice cream maker machine continue reading: After 20 minutes remove the ice cream mixture from the freezer and transfer to your ice cream machine (I use this one). Make sure to follow the directions of your ice cream machine. Every machine is different. After about 20 to 25 minutes, the ice cream should be ready for the next step. You want to make sure that the mix is really thick and ice-cream-like consistency. 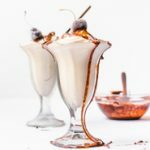 Serve vanilla ice cream sundae in a cup, or if you want the classic frosty swirl, transfer ice cream to a piping bag with a very wide tip and swirl into a sundae glass cup. I like to place the piping bag (with mix in it) in the freezer for around 15 minutes to allow it to thicken up before serving, as that makes it easier to swirl. These are the piping bags and the wide tip that I use (affiliate link). If you do not have an ice cream maker: After blending the vanilla ice cream mixture, pour into ice cube trays and freeze overnight or for at least 6 to 8 hours. Once frozen, blend the cubes up using a food processor or blender with a wide container. You may have to add bits of water or plant milk to help process the ice cream down if your food processor/blender is struggling. Once processed, you can transfer straight to a cup or for swirly effect, transfer to piping bag with a wide tip and swirl into an ice cream sundae cup. Drizzle hot chocolate fudge all over vanilla ice cream sundae and top with cacao nibs, shredded nuts, or both! Enjoy! very important tip – if you want to get the swirl effect using the piping bag, the mix must be very very cold and not melted/liquidity. So, what i like to do is to transfer the mix into the piping bag and then let it sit in the freezer for about 15 minutes so that it can thicken up again. Keywords: ice cream, ice cream sundae, chocolate, vanilla, hot fudge, vegan, plant based, oil free, healthy.